Two of the bigger stories this season are the Western Conference playoff race, and the massive tank job being pulled by teams without playoff aspirations. This is where those two stories intersect. While tanking has been maligned in the last few seasons, mainly against the Sixers’ openness to tanking, this season has been especially bad. The likely outcome this season is that there will be 9 teams under 30 wins. For some context, over the last 6 seasons, as tanking has evolved into a more accepted rebuild strategy, 9 teams under 30 wins is the most since the 2011-2012 season that had 11 teams under 30. The kicker? That was the lockout shortened season with only 66 games. Sure it was also the Anthony Davis draft, but playing 16 less games hurts totals. 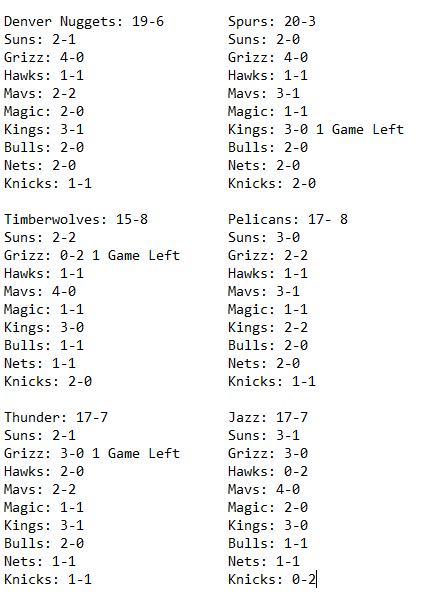 Besides that season, 9 teams were under 30 wins in 2009-2010. More than 9 teams? I stopped looking after the 99-2000 season. Basically, it’s fairly unprecedented that this many teams are losing this much. Again, if you want the West simplified, if you get to 47 wins, you’re in. Finally, I wanted to see which of these Dirty 30 fared the best. 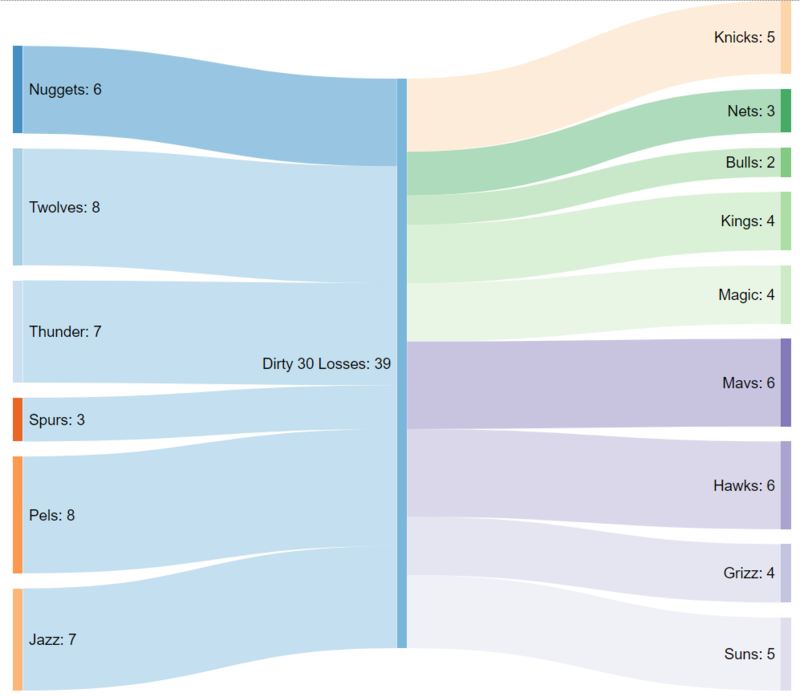 Plus it gave me a chance to play with a chart format that I don’t often use. Basically, the losses against the group are on the left and how they were spread out is on the right.